What is Funeral Home Software? 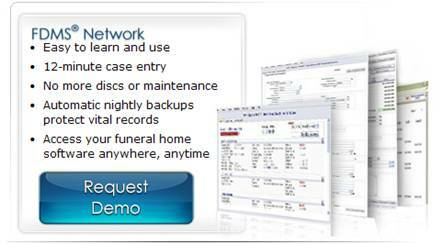 Funeral home software is an easier and more efficient way to handle your case management. It is a way to automate the paperwork process and save time. Quality data management software allows you to print death certificates, funeral contracts, veteran's forms, social security forms, transit permits, and much more. The best software also allows you to see the health of your funeral home with real-time financial, inventory, and pre-need reports. Many funeral homes still do all their paperwork by hand. You may have a program installed on a computer you bought years ago. How can you maximize the latest technology and keep your software updated to meet your state's requirements as well as your ever changing business needs? Funeral home software now can be an evolving service. Instead of being tied to an obsolete program that requires manual installations of version updates, you can have a program where new tools, modifications and daily back-ups are all managed by our staff. Aldor Solutions has funeral home software that makes case management simple, and takes care of all these needs. Aldor Solutions has been the leader in funeral home software since 1980. Our expertise and technical capabilities allow us to meet the needs of individual or multi-location organizations. To see more about our tools designed for larger organizations, click on Enterprise Functionality for more information or request a demo to try out the program. Are you using FDMS Network, but wonder what reporting capabilities you could be taking advantage of? Check out our current Featured Report to see what other clients have found useful to their business. Our Support Team can be contacted by phone, fax, email and our ticket system. Need to speak to a staff member directly? Call our toll free number to contact us between 8am – 5pm AZ time. To send us a message, complete our Message Form on the Contact Us page. To start a ticket, click on our Support page. Your feedback is important to us. Many of the improvements and new functionality to FDMS Network and our website development comes from client feedback. © Copyright 2019 Aldor Solutions, All Rights Reserved.